Character templates for samurai, ninja, warrior priests, geisha, elemental sorcerers and more. Each template also features a sample character ready for adventure! Racial packages for fox spirits, artifact spirits, long-necks and the vampiric gaki. Rules for Japanese magic, with new spells, new elemental colleges and notes on Asian alchemy. 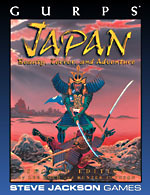 New martial arts styles from weapon arts like Miyamoto Musashi's Nito Ryu (School of Two Swords) to bajutsu (horsemanship) and suieijutsu (fighting in water) to the truly esoteric kiaijutsu (spirit harmony techniques). You can stand on either side as the explorers from the West meet the ancient Empire of the Rising Sun. 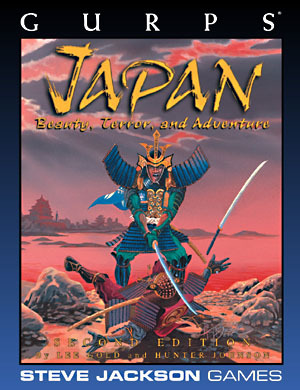 Magic and swordplay, power and poetry, beauty and terror – all await you in GURPS Japan Second Edition! GURPS China – From the Great Wall to Tiananmen Square, from the Imperial Wars to the Boxer Rebellion, from Marco Polo to Mao, no fictional roleplaying setting can equal the scope and grandeur of China!